Home / News / America / Brazil takes over America for the tenth time! Brazil has, once again, proved that they are the rulers of the continent. After beating Argentina by 38-20 they obtained the Pan American Championship title for the tenth time in history. That makes it 10 out of 14. Absolute dominance from the 2013 World champions, who are still far from the rest of their opponents in America. SAG Villa Ballester was the place to be for handball fans in Buenos Aires, Argentina, on Sunday afternoon. 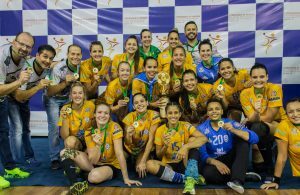 The decisive match of the Pan American Championship was due at 16:15hs and Argentina and Brazil were the protagonists. 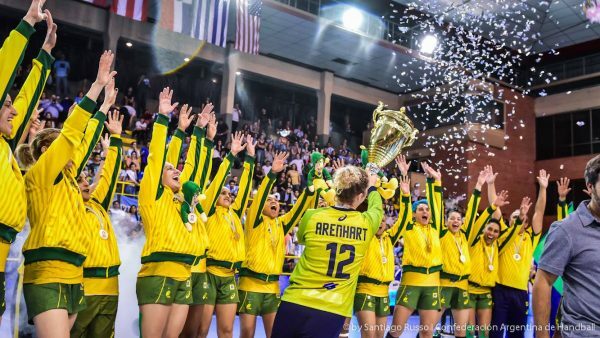 Both teams reached the final outplaying their rivals and, after the qualification for the World Championship in Germany, it all came down to the continental title. From the beginning of the match, the former World champions stepped on the gas pedal and produced a quick goal difference that they would mantain (and extend) throughout the entire match. 6-2 after 12 minutes forced coach Eduardo Peruchena to ask for Argentina’s first time out to try and make the girls ‘get into’ the match. The rotation of the players did not bring much air to the locals and Brazil kept on imposing their pace in attack and making it hard in defence for their rivals. Not only the mobility was good, but Bárbara Arenhart was also responding under the posts. The first half finished 18-8, a difference that was unsurmountable for the Argentinians. The second half was like a replica of the first period, but neither team slowed down. While Brazil looked like they were trying to reach the 40 goal mark, the locals, supported by their crowd (the stadium hosted nearly 3,000 people) were fighting back to avoid it. The final score was a reflection of the 60 minutes of match, where the defending champions dominated from beginning to end. Eduarda Amorim was top scorer of the match with seven goals, the highest score for her on a single match during the championship. “I’m very happy, I was already Pan American champion with the youth and juniors team, but this is my first title with the seniors. I had the chance to re encounter athletes I coached 15 years ago, to work with them again, and that was something very emotional. I think they took this tournament very seriously, very determined to obtain this title, not only the qualification for the World Championship, but also the title. They know that we have to change some things if we want to be, once again, among the best teams in the world, and their open to all of that. They came to the national team with their minds open, their hearts open. We’ve already changed some things, but we have a lot of work ahead for Tokyo, where we will try to finally get that Olympic medal”, expessed a moved Sergio Graciano, who commanded the Brazilian squad and will join forces with Jorge Dueñas at least until December after the World Championship. Graciano added: “Our defence was our strongest point. Except for the first half of the match against Paraguay, we did it very well, the players and were able to make the changes correctly and we stole lots of balls, which made it easier to play the transitions. For the very little time we had to prepare this new defence, the girls were able to absorb the new system and to show it on court”. On the other side, Eduardo Peruchena sounded a bit anguished about the final result, after a very good performance throughout the tournament: “We were unable to find the ways to their goal, we were a bit anxious in attack and that is a terrible sin against Brazil. Our plan was to play at our speed, trying to control their fast breaks to have them score only 20 or 25 goals, which is what gave us chances to be closed in the scoreboard in Toronto (Pan American Games 2015) and in Denmark (2015 World Championship), but once they’re in control of the match and at their speed is very difficult to play against them. I’ll stay with our 20 goals as a positive point, but their 38 goals are very difficult for us. Our goal is to keep them in 25 goals or the closest possible”. Peruchena, who lamented the injury suffered by team captain and the “spinal cord” of the team, Antonela Mena (torn her knee on the semifinal against Paraguay), said that despite her absence “which was a very tough shock, from the tactic an animic point of view, evidenced the emotional maturity of this group, which was able to face the situation bravely. This kind of matches are, different from the rest of the matches of the tournament, they’re at the level of ‘Olympic Games’ encounters, so it’s difficult to change from, with no disrespect to our other rivals, from one level to the other in such short time, and I think we were punished for it”. The coach added: “The positive things that I hold on to are the fact that we’re giving minutes to lots of young players, that one of our goalkeepers (Nadia Bordón) is back in shape after a few injuries, that we also have Elke Karsten back in the team; unfortunately we were unable to take the match to our ‘terrain’, so we still have to work on that as the new team that we are, we’re very hopeful about this team for the future that it has and for the way they’re dedicating themselves to this cause”. The three teams qualified for Germany 2017 are Brazil, Argentina and Paraguay.